Though trade deals ensure cheaper imports, they don’t deliver the promised growth Maine needs. Back in the ’90s, free-trade advocates made two predictions: Manufacturing jobs would move offshore, where labor and other costs were lower, but low prices for imported manufactured goods here would circulate money through the economy that would stimulate the growth of service jobs. The first part certainly came true – manufacturing jobs in Maine declined by a third in the eight years after we signed the North American Free Trade Agreement – but the second has been much more problematic. Most of the people who lost those manufacturing jobs when the plants moved away were not able to make the transition to a new kind of work. And towns that lost large employers were hollowed out and not replenished with new growth. Industry and government officials celebrated National Manufacturing Day on Friday, and it is a good occasion to recognize the value that manufacturing jobs create and what was lost when mills and jobs disappeared. It was much greater than what was returned in the form of cheap imports. 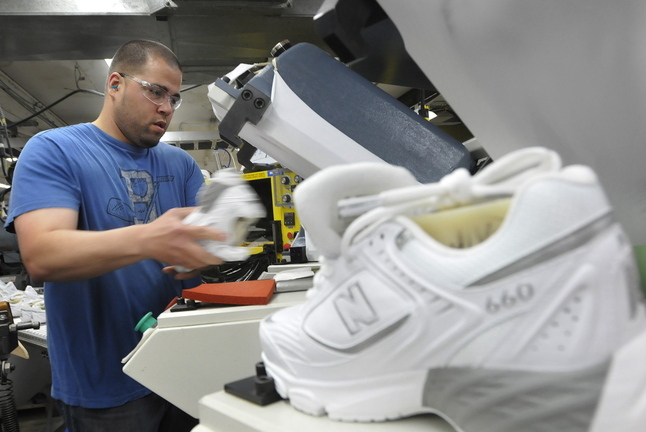 It is in that light that we should view the new Trans-Pacific Partnership, now under negotiation, which could wipe out a tariff on imported shoes that would effectively erase New Balance, the last domestic athletic shoe manufacturer, and its 900 jobs in Maine. American policymakers should reflect on what those jobs really mean to towns like Norridgewock and Skowhegan. National and state policy should be focused on building new industries in sectors such as information and clean energy technology, but it should also aim to keep the manufacturing jobs that we already have and are hard to replace. Manufacturing jobs pay better than most other work. The Maine Department of Labor reports that the average wage in manufacturing is $75,400 a year. The average wage for all other non-farm jobs is $36,500. It is hard to imagine a bigger boost to the state’s economy than increasing the number of jobs in the manufacturing sector. There is more than one way to achieve that. Research and development grants are one way to build new companies and new products. Supporting emerging technologies, such as offshore wind, is another. And so is making sure that regional technical schools and community colleges are graduating students with the right skills to fill those jobs. But holding on to what we have is also important. It’s not protectionism to say that companies that choose to keep operations in America should not have to battle offshore competitors that exploit the environment and their workforce to bring down prices. Not all jobs are created equal. Some bring more value to their communities, and that should not be taken lightly.